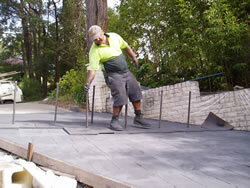 The quality of stamped concrete depends on the experience of the applicator. Planning and management of the process by the applicator is essential. Sub-standard work can result in poor colour consistency, peeling or flaking surfaces, crusting, wearing of colour finishes, shrinkage, cracking in all forms, inadequate concrete cover and inadequate stamping of patterns. Failure to apply two base coats of colour hardener. Colours pale with little depth or lustre. Using the release colour coating as the second colour application. Again pale colours can be more prone to wearing or fading. Reinforcement too shallow — stamped depth can be up to 200mm — corrosion results. Working colour into a surface that is too wet or using colour powder as a `drier’ can result in crusting of the surface, peeling, drummy surfaces or surface crazing. Inadequate removal of release agent which causes colour lifting. 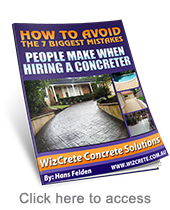 Placing concrete to wet — high shrinkage cracking. `Crack inducement strips’ — placed too late, rearing effect on surface. If reinforcement is too close to surface adjoining areas are disturbed with cracks either side of the strip. Control joints not correctly spaced — excessive shrinkage cracking. Hot, dry or windy weather — plastic cracking — bad planning. Preventative action – use wind breaks, reduce size of pour, use more labour, use wind breaks, wait for cooler part of the day or cover the concrete. Poor sealing can result in surface contamination and reduced durability. If the sealer is applied too early before the surface has hardened, colour-surface can be dislodged or when applied with a broom colour can be dragged across the surface. It is best to apply sealers with spray or roller when surface is still drying (after approx 4 hours in hot weather) or waits until the surface has hardened sufficiently to broom on sealer.